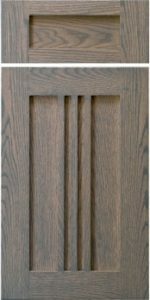 The Berkley door is a mission inspired mullion door, only it uses a veneered center panel instead of glass. A great accent door or, if used wisely, a good design for a whole kitchen. Framing is 2-3/4″. Note that number of mullions and spacing is fixed on this door. No, mullion configuration is standard for the design. Simply order as 'Frame only' to delete the center panel. Be careful with narrower doors. Care must be taken when designing your kitchen to use as wide a cabinet as is possible. When the door becomes too narrow, use a Stockbridge shaker door instead. A great door for use with Quarter Sawn Red or White Oak.